One of my favorite images, and the final image I used in my print portfolio. I've been debating the way I should go about sharing this group of images for several months now. This photo shoot was put together in April when I began drawing inspiration images for my print portfolio to first be shown at The Art Institute of Pittsburgh's quarterly Portfolio Show when I graduated. I wanted to collaborate with another artist specifically for this shoot, and special effects makeup was the way I decided I would go. I knew I had wanted to do a "mermaid" themed shoot with my friend Victoria for quite a while. 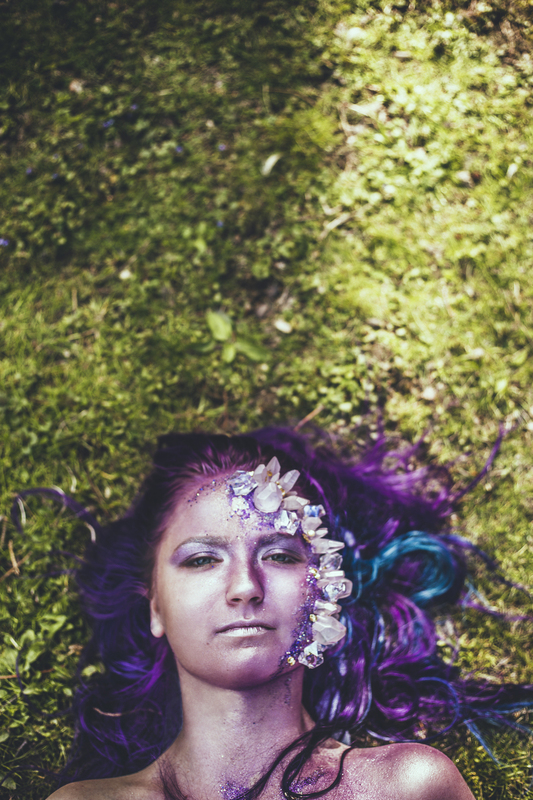 When your friend has purple and blue hair and your a photographer, there's no question about who to use for a model. Funny enough, I first got the idea to have her model for me because she wore a shirt to school that said something along the lines of "I'm a Mermaid". Later I pulled inspiration from Ephesians 5:14, "This is why it is said, 'Wake up, sleeper, rise from the dead, and Christ will shine on you.'" I wanted the shoot to have this idea of a "mermaid" turning away from her life that was not what she wanted and not where she was supposed to be. 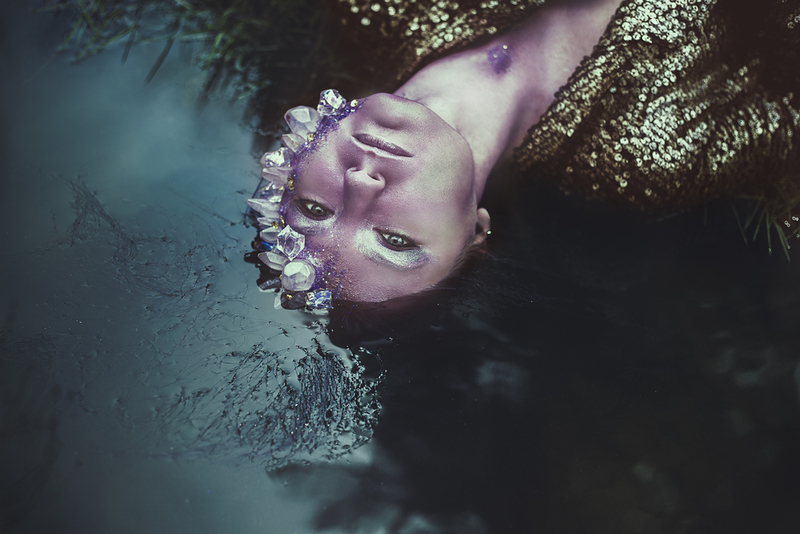 The crystals on her face would represent the time that she had been in that stagnant place and almost appeared to be dead (rise from the dead). She then "wakes up" and realizes where she not only wants to be, but where she is meant to be. I ended up using a single image from this shoot for my print portfolio, but I enjoyed the images so much as a whole that I wanted to do something bigger to share them. It didn't dawn on me until a couple weeks ago that I had written a short script for my Conceptual Storytelling class at The Art Institute. This was actually a filmmaking elective rather than a photography class, but I took it to have enough credits to graduate on time. I also thought it would be a neat opportunity to work on developing a story for each of my series, and would help me to see movies (which is where I draw a lot of my inspiration) in another way, as far as the way the story is told. In the first planning stages, the way I develop a photograph in my head is really like a mini movie trailer, literally playing like a scene of a film rather than just still images. Then in the following planning steps, I'll decide on makeup, hair, location, lighting, etc. I work on this entire process all while trying to figure out who the character is, where they came from, what their motivation is, and what is driving the story. This script was an in-class assignment, assigned at 8:00 AM and due before class was over at noon. Trying to figure out what the heck I should write about, and never having experience writing a script or really any story that wasn't totally lame or in third grade (especially at 8 in the morning), I kept going back to the idea behind this "mermaid" themed shoot that I had been editing on and off the last several weeks. I kept thinking how amazing it would be to know what was going through this character's mind and why she was where she was and what her expressions meant. The script was written in early June, so the shoot, which took place in early May, had already been completed, meaning the images don't align in complete perfection. However, I think I've found an awesome process to use in order to do a creative shoot like this in the future and have the viewers try to see this "movie trailer" or "short film" using their imagination between the script and the photos I use together. >>Side note: I really can't believe I'm posting this script for the general public to read because honest to goodness, I've never been so self-conscious about a piece of writing I've ever done in my life. But it's all for a good cause. Below is the script, followed by the images, followed by some behind the scenes. Enjoy!